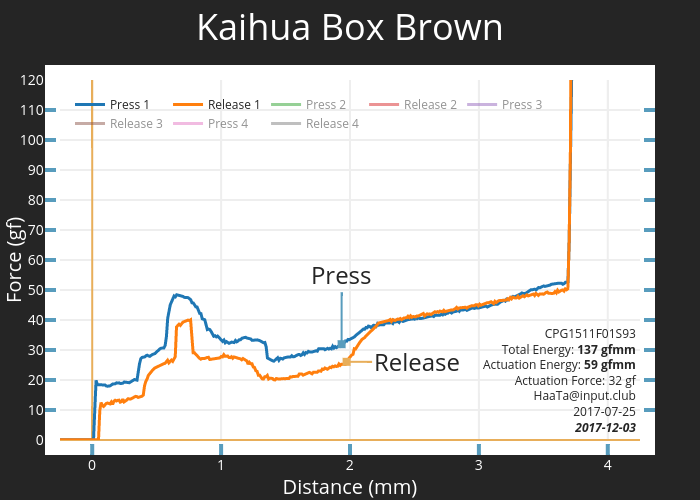 Box Brown switches provide sharply tactile, light key travel with numerous advantages from Kaihua's Box switch architecture. Precision molds and tooling result in an increased lifespan — Box switches last 25% longer than regular MX variants during stress testing. The square stems also virtually eliminate wobble. The slider design and sealed contacts provide superior contaminant protection. If liquids or dust somehow penetrate a switch, lower housing vents and a slider drainage port eject the unwanted substances. Compatibility Note: pre-retooling Box switches may cause cracking in certain aftermarket ABS keycap sets — notably those from GMK. PBT / POM keycaps will not crack, but they may experience stretching. Stock WhiteFox / NightFox / Kira keycaps are not affected. Internal testing indicates that the cracking / stretching does not affect GMK / aftermarket sets universally, so yours may fit correctly on Box switches. We recommend testing a spare keycap on your Box switches for at least two weeks, then performing a visual inspection / fitment test on Cherry MX switches, before applying the entire set.